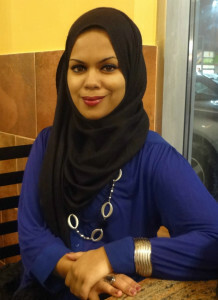 Silmi Abdullah completed a law degree at the University of Ottawa in 2012. She then articled with the Metropolitan Action Committee on Violence against Women and Children’s (METRAC) Community Justice Program, funded by The Law Foundation of Ontario. She produced accessible legal information for women facing violence and wrote material on changes in immigration and refugee law, including the new refugee system, spousal sponsorship and conditional permanent residence. This information has been integrated on METRAC’s legal information website, the Ontario Women’s Justice Network, and incorporated into face-to-face legal trainings. She also assisted with responding to legal information requests from service providers and women, collaborated with the legal team in the delivery of legal webinars and supported a partnership project on forced marriage. “Articling with METRAC has been absolutely fantastic,” says Silmi, noting that the organization brings together talents and skills of diverse people to prevent violence against women and youth. She has had a unique learning experience and says, “It motivates me every second to continue to learn and excel in my work in the area of social justice”. Silmi believes that every lawyer who works in the area of social justice “has a tremendous responsibility to bridge the gap between the legal system and the broader community” as most people do not know their rights, how to navigate the system or how to find help. “Unfortunately, the most marginalized people in our communities face the most adverse consequences of such inaccessibility.” Working with METRAC has not only re-affirmed her belief but has taught her skills to put that belief into practice. She hopes to apply “the skills, vision and perspective” she has acquired at METRAC to place access to justice and community service at the core of her practice.